Work: Delegate to Continental Congress, 1774-’87; Signed Declaration of Independence, 1776; Signed Articles of Confederation, 1777; State court Judge, Member of Federal constitutional convention, 1787; Elected Governor of New Hampshire. Josiah Bartlett was born at Amesbury, Massachusetts, in November, 1729. He studied the science of medicine, and practiced as a physician at Kingston, in New Hampshire. He became involved in politics and was elected a member of the Colonial Legislature. He was noted as a principled legislator, not susceptible to pressure from the Royal Governor, and as an active advocate against British oppression. He was a member of a Committee of Safety, and served as commander of a militia regiment in 1775. In that year he was also elected to represent New Hampshire in the Continental Congress. 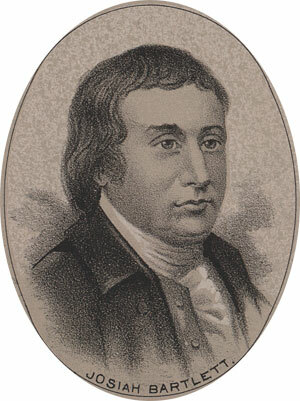 He voted for independence, and was the first to sign the Declaration, after John Hancock. He continued to serve in 1777 and participated in the ratification of the Articles of Confederation. He later filled the offices of Judge of Common Pleas and of the Supreme Court of his state, and joined the federal Constitutional Convention in 1787. He was elected president, and then governor, of New Hampshire. He died May 19, 1795.